The Windswept Ridge Golf Villas are located, quite literally, on a wind swept ridge near the golf course in The Currituck Club in Corolla, NC. 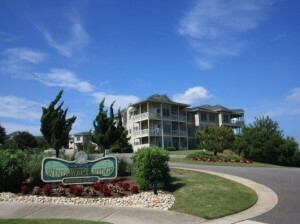 Thirty units are divided into two, three-story buildings with sweeping view of the ocean, sound, and golf course. The elevators in each of the buildings afford easy accessibility and owners and guests enjoy use of the private pool and tennis court. Owners are members of two associations–Windswept Ridge and The Currituck Club–and enjoy all of the Currituck Club amenities such as three pools, tennis courts, basketball, volleyball, fitness center, community game room, seasonal trolley service, beach valet, and miles of bike paths.